This is an amazing story about copywriting: for the past 18 months I’ve enjoyed recording dozens of daily telephone prompts for an international audio-branding company. However, the copy has always been very hard to read. Single spaced lines and center aligned. 10 pt. font. Not very user-friendly Script Formatting for Voice Overs. Before Christmas, I finally broke down and politely asked to change to 1.5 or double spaced lines and larger font. I suggested that this would also reduce the huge number of typos their writers made. I reformatted the scripts as an example for them to consider. I also acknowledged that I’m just some voice over talent and I know my place in the production chain! Today the scripts came in formatted per my suggestion. The Head Editor made the changes company wide! My producer contact said voice talents were turning around the copy faster and there were fewer typos. Everybody loved it. The funny part is that previously the scripts had long sentences that were clunky for the spoken word. Voila! With the new formatting, all the writers are now writing zippy short-sentences. Never use single spacing unless you have to! 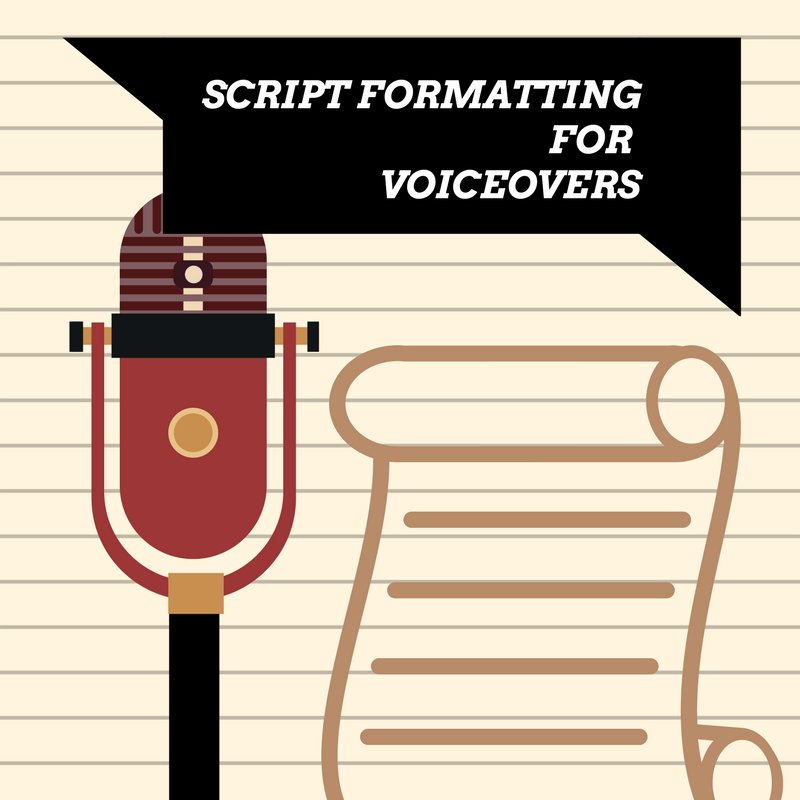 Here’s are some general standards to follow when formatting voice over scripts. 1.) Use 12 pt. font. 2.) Choose 1.5 or Double-spaced lines. 3.) Avoid narrow columns (difficult when story-boarding, I understand). 4.) DON’T WRITE IN ALL-CAPS! THIS IS AN AFFECTED THROWBACK FROM WHEN PRODUCTION PRINTERS OUTPUT ONLY IN ALL-CAPS. 5.) Use left-alignment, so that all the words have uniform spacing between them. 6.) Don’t use garbage fonts like Comic Sans or Papyrus. 7.) No, really, please don’t use garbage fonts. Thank you. Following these guidelines won’t just help your voice over talent. It will help everyone in the production chain work more easily with the scripts. They’ll be easier to proof, mark-up, and follow along. It’s a win-win for everyone.